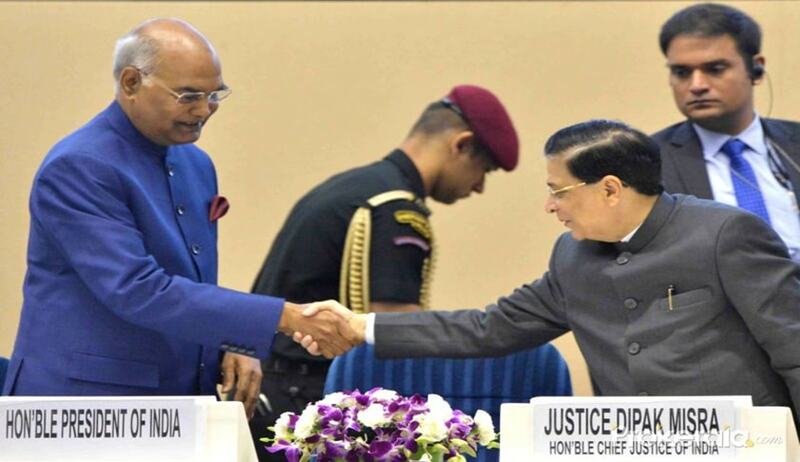 Defending the judiciary’s role guaranteed under the Constitution, Chief Justice of India Dipak Misra on Saturday said the judiciary does not intend to enter into the policy-making areas, but interprets the policies made by executive. The CJI also said the court is obliged to stand by the citizens, if their fundamental rights are encroached by any of the government entities while terming the protection of fundamental rights of citizens as “sancrosanct duty” of judiciary. On the issue of balancing roles of three wings - Legislature, Executive and Judiciary towards country’s development, Justice Misra said no political ideology, no social ideology make the country proud, it is only the constitutional ideology, constitutional philosophy, its spiritualism keep the country alive. Speaking at the inaugural function of the two-day long national Law Day celebration, organised by the Law Commission of India and NITI Aayog, he said it is only the Constitution which brings the three of them together. “It is in the Constitution that we find the nature of political and social integration. Constitution of India is the voluminous and lively document which tells us about the integration. It tells us about their roles and the governance-let it be legislature, executive or judiciary. He cited the Vishakha judgment in which the women’s rights were protected by the court. Similarly for protection of children’s rights, the court has passed several orders. Once again defending that the judiciary’s function, the CJI said judiciary plays a crucial role in the ambit of constitutional governance. The executive should also do its responsibilities within its respective sphere for the socio-economic growth. He hoped that the three organs of the state to show cooperation with each other and respect Constitutional values, morals, philosophy so that the country thrives. President Ram Nath Kovind, who inaugurated the two day-long Law Day celebration, raised several issues faced by common people to access to justice. He expressed concern over the low representation of people from SC/ST and OBC in the judicial appointments and sought judiciary to take steps to address these issues. Speaking on speedy justice system, the President said India has expensive legal system which makes the poor deprived of from getting justice. In addition, the repeated adjournments need to be avoided. “Pro bono service to the poor should not be left at the will of lawyers, but the same should be institutionalized. The information and technology should be fully utilized by the judiciary so that the delay can be avoided. This will not only decongest the books, but also enhance the governance,” he said. Lok Sabha Speaker Sumitra Mahajan, Niti Aayog chairman Amitabh Kant, vice-chairman Rajiv Kumar and MoS Law and Justice PP Chaudhary were also among the dignitaries present there.